The Richway Bio Belt is a medical device that emits infrared and negative ion therapies to your body. Obviously, as a belt, it is designed to focus on your abdomen and back areas but can be used on any area of your body. Unlike the other biomat models, the biomat belt uses eight different stones to combine into a healing experience that is unmatched and meant to feed your "second brain", your gut, with the respect it deserves. THE NEW BIOBELT 7000mz IS NOW AVAILABLE! Directing infrared heat into your abdominal region or back can have many therapeutic results from weight loss to aleviating back pain to boosting your immune system. The Bio Belt is the perfect delivery device for thermotherapy for the center of your body. Learn more about infrared therapy and its benefits. Unlike the other Biomat models, the Bio Belt contains eight precious stones including Amethyst, Black Tourmaline, Green Jade, Topaz, Quartz Crystal, Tiger Eye, Citrine and Elvan. Some of these stones emit infrared rays and some serve other health purposes. Learn more about how each of these precious stones can improve your health. 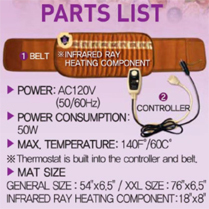 The Biomat is a unique delivery device, approved by the USFDA, for infrared ray therapy as well as other important health benefits. Its patented, one of a kind construction is made up of seventeen distinct layers that combine to give you a health experience that is unrivaled. Learn more about the construction of the Bio Belt. Among the many benefits of using the Bio Belt are: Increased beneficial bacteria in your gut including serotonin, weight loss, better psychological health, alleviate back and muscle pain, cancer and diabetes. We should never underestimate the effects of a healthy abdominal region. Your "center" is important to your overall health and when it is not taken care of properly can lead to many diseases and ailments. Learn more. Visit our order page to order your Richway Bio Belt and while you're there check out all of the other Biomats that Richway has to offer. Used together, two Biomats can give you a much more powerful healing experience. ORDER NOW! ORDER YOUR BIOMAT BELT NOW!